The highly awaited TV series, Game of Thrones, somehow got its running Season6 episodes leaked over the Internet. In all, it’s been rumored that episode 5, 6, 7 have surfaced over KickAssTorrents, PirateBay and other torrent websites for download. And according to the time-stamp on KAT website, the eposide 5 was leaked 8 hours ago. The leak has surfaced as Game of Thrones officially got aired on HBO’s Nordic website. Episode 5 of Season6 was available last night on HBO Nordic which is available in Sweden, Denmark, Norway and Finland. And somehow, TorrentFreak got a snapshot of the leaked episode. The episode have been currently removed from HBO’s Nordic website. 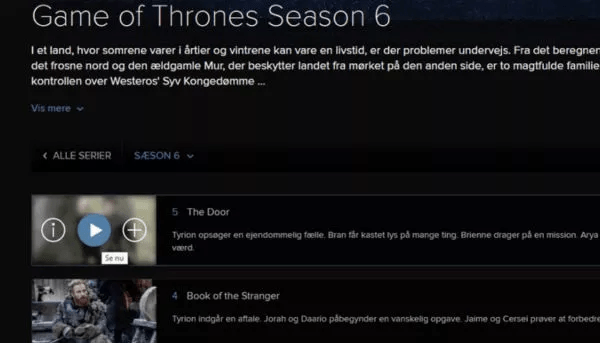 There may be a possibility that these leaked episodes 6 & 7 may also be fake, as only Eposide 5 had got aired on HBONordic. So if you are planning to download, download it at your own risk, as it can be a threat to your security. Taking the advantage of popularity of the series, someone can infect your system by uploading a malicious script over the torrent website to get access to your systems.